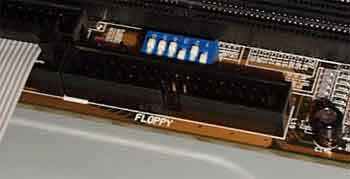 A standard part of a computer that serves for transfer of the data between computers. At present it is an obsolete and slow solution with low data capacity. It plays an important role in case you need to transfer or store very small amount of data, or to start the system in case of emergency using a system diskette. Exceptionally you can meet no-drive computers - PC without FDD and HDD. Start is run using a network card with a chip for start from the network. Ideal for high security - the data are designated only for being red. Saving of money for FDD and HDD. Size 3,5" (8,9cm) - Widespread, used to transfer little files and documents. Capacity: 1,44MB. For transfer of larger files and distribution of programs the CD disks are being used. Marked with A letter. Size 5,25" (13,3cm) - At present out of use, capacity 1,2MB. Marked with B letter. ZIP by IOMEGA company - Doesn't substitute the classic diskette, uses media similar to the normal diskette but a little bit higher. Necessary to have FDD. Possible to connect it through IDE cable (the same as the one used for HDD and CD) or through parallel port or SCSI controller. Capacity 100 and 250MB. Maximum transmission speed: 1.4MB/s, access time: 29ms. Formatting - Preparing the diskette for using. Present diskettes do not require formatting. 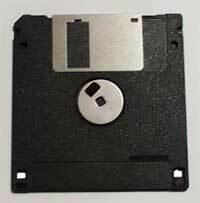 It is now used for deleting the data from the diskette and to check if it is not damaged. 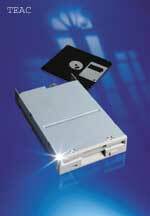 Data security - You should protect the diskette from dust, mechanical damage, high temperatures and magnetic effect. Although you treat the diskettes right and protect them they are very erroneous. It is not recommended to rely on them as on 100% instrument for data backup. Protection from recording - Covering the little square hole on the diskette you ensure the protection from recording. A damaged diskette - Try to use the diskette in another computer or to use scandisk program to check the surface of the diskette. A cleaning diskette - When you use the FDD often you should know that there cumulates a lot of dust. 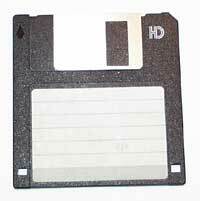 To clean the FDD you can use a cleaning diskette. Data cable with crossing and a source connected to the drive. When using a crossed cable you have to use a connector behind the crossing (see picture). The connector in front of the crossing is used for another FDD (B:). When you install several drives there can be not enough space for the other drive in the computer case. When you meet this problem you can buy a frame for installation of the 3.5" format device into 5.25" position. During the start the data about detecting devices are displayed. For most of the present computers the diskette becomes too small and not suitable to be used. As a media for programs installation you find rather CD. For not everyday use the most common FDD is enough. A repair usually means a change for a new drive. (Particular parts can be substituted with parts from another drive, but it is not recommended because it would be more expensive than a new drive- 500 - 600 CZK). If you are not sure if the drive is wrong check it in another computer. Be careful! Some problems can cause malfunction of the drive - cables, wrong controller, defected diskette, wrong BIOS system settings.